It was years ago out in East Vancouver where I saw the first of what I call “working mannequins.” She was standing on the side of the road. She’d been rigged up with mechanics that allowed her arms to move a sign in a circle. From what I recall, she was trying to lure people into a coin shop. I vowed to visit, find out more about her and see if she was attracting a crowd to the store but I was never willing to take the bus out to that part of Vancouver. Still, she remains a fond memory. 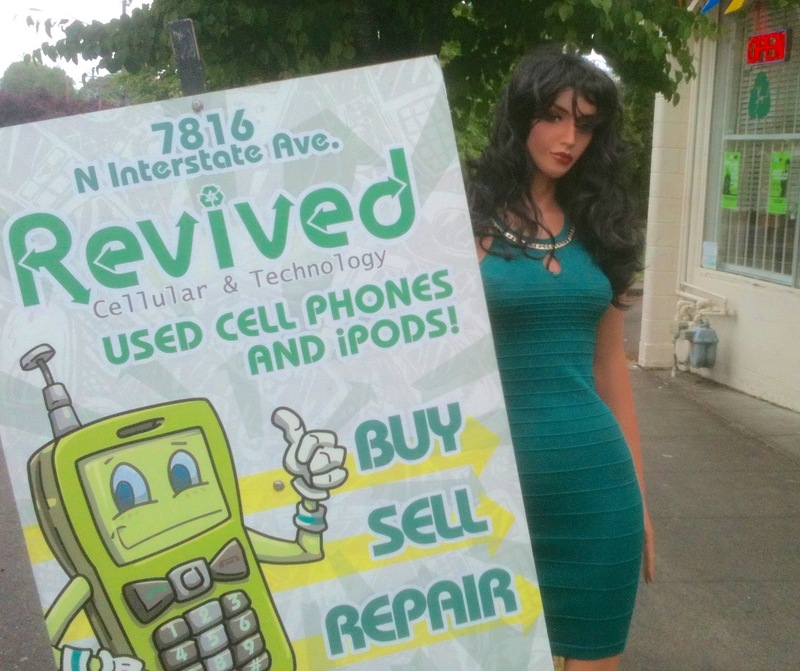 The cell phone industry has jumped on the notion that there’s a need for human looking forms to stand outside their businesses with signs propped against their bodies. The mattress folks seem to be saying, “hey we hire actual live humans who twirl signs about sales.” That screams worst job in the world. I don’t care how many podcasts or iPods you listen to all day. Who wants to stand around outside for hours on end with a sign for any money is better than no money wages? This makes the working mannequins so good at their jobs. They don’t talk so they don’t complain about not getting paid. They don’t take breaks, bathroom, smoke or otherwise. They stand all day or for the rest of their mannequin lives and they never get tired. I have to consider if these working ladies accomplish much other than making a noticeable scenic diversion. It’s hard to tell. As sign holders, they add a bit of pizzaz to whatever kind of wooden or metal frame could be mustered up and slung down on the sidewalk as a free standing sign. Plus in the cases of working mannequins who exhibit sign movement–that adds a whole other dimension to the proceedings. 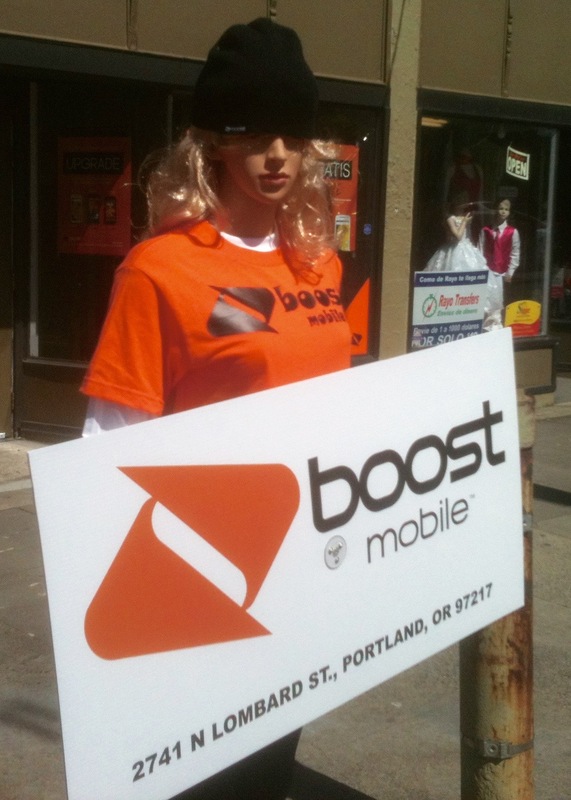 I can’t imagine how you retrofit a mannequin so that they move a sign in a circle. It’s a simple, yet effective use of mechanical knowledge. Working mannequins have been dressed up in a variety of ways. Some look like store employees while others are allowed to appear in elegant evening wear. Usually long tresses are provided but when an appropriate wig is lacking or a bad hair day is happening the solution seems to be a knit cap. While mannequin fever is not contagious once contracted it may be incurable. I have a few more mannequin posts in the pipeline but I’m not going to let this blog become one of those mannequin blogs. I will also never allow a mannequin to guest blog for me, if that offers any comfort. Then again maybe I could hire one of the more literary working mannequins so I could sit back and relax. Detail: (Look down) Sandbag stand. Note: This post appears to be nothing more than a series of ads for the cell phone industry. It’s having no effect on me because I’m already locked into a contract with another carrier. The rest of their mannequin lives could be a long long time! I hope, when the big one hits, there are mannequins pointing the way to the emergency shelters. Also, I’m going to suggest one for the hallway at my workplace. People never read the sign pointing to the bathroom. Thanks for giving me some food fir thought. Your blog is very inspiring. I like the idea of random mannequins offering directions. Their should be no reason to have mannequin unemployment. Freakin’ corporate mannequins! First they take our jobs and now they’re taking our women! This is the last straw! Rise up my Orbital brothers and sisters! Resist! Battle back! I’m a bit more worried about robots taking our jobs after listening to a recent Fresh Air podcast. I need to do some research on mannequin manufacturing. This could effect the whole economy.